I love making Shortbread in the lead up to Christmas and this White Chocolate Shortbread has quickly become one of my new favourite recipes! 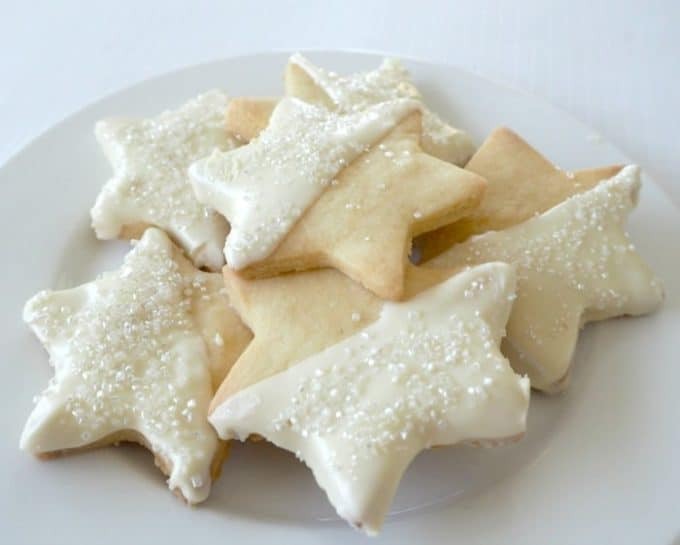 I first got the idea for this recipe thanks to my sister who is obsessed with White Chocolate Shortbread Stars from her local cafe, such a simple idea but they taste amazing! When I heard she pays around $3 for just one biscuit, I knew I had to try and make a batch for her. 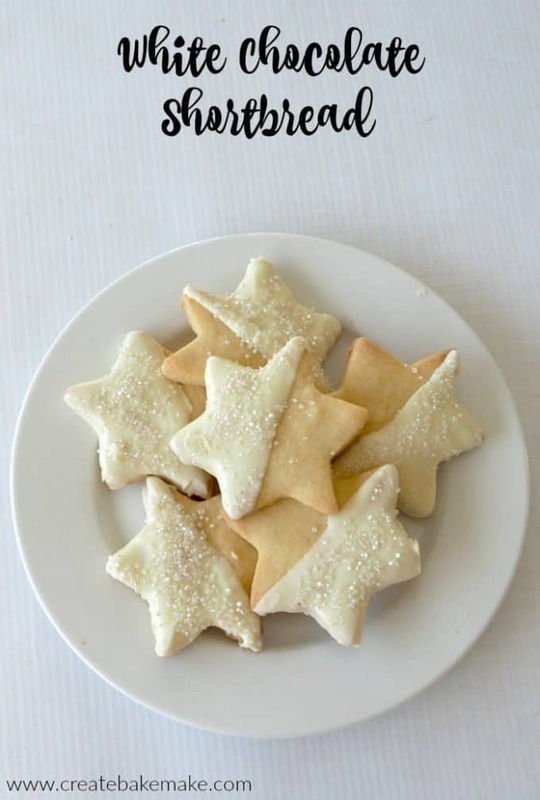 I used my Mum’s Shortbread recipe which I have been making for years now and then once the shortbread had completely cooled I simply dipped it into the white chocolate and then added some sprinkles to the top – too easy! You an use anything you like to decorate your White Chocolate Shortbread, 100s & 1000s, cachous or edible glitter like I did. They are also perfectly fine left plain. 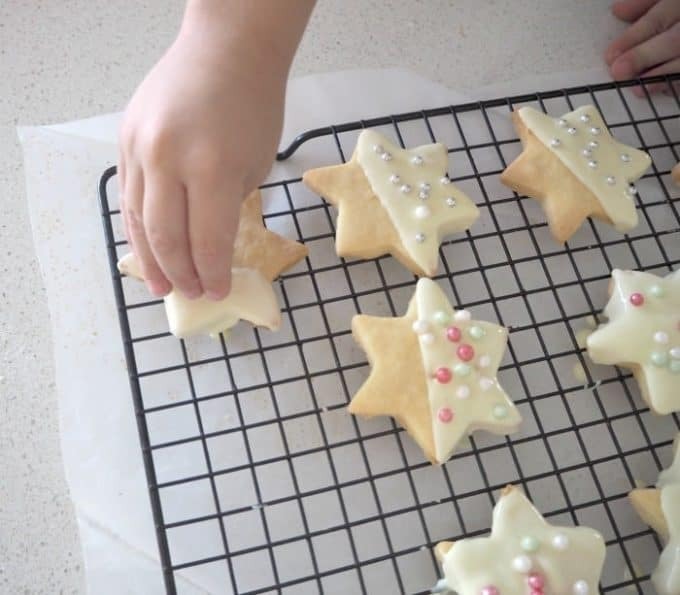 The boys also couldn’t resist helping me decorate this shortbread and we’ve got plans to make another batch for their kindy teachers and friends. Make sure your bench is cool when rolling and cutting your shortbread as it will quickly go soft thanks to the high butter content. I try to make mine early in the morning or pop the air conditioner on if it’s really hot. Roll and cut half of your shortbread mixture at a time and wrap the other half and pop in the fridge so that it doesn’t dry out and start to crumble. Cooking times WILL vary depending on the size of the cutter used and the thickness of your shortbread. It’s a good idea to watch your shortbread closely as just a minute or two of extra cooking time can make a big difference. Preheat your oven to 190 degrees and line two trays with baking paper. Beat together the butter, sugar and rice flour until the mixture turns white. Add a few drops of vanilla essence and continue to beat. Gradually add the flour to the mixture, while mixing on a low speed until a paste forms. Turn mixture onto a cool bench dusted with flour and work until a smooth ball forms - I find it easiest to split the mixture into two balls and place one in the fridge, covered in glad wrap. 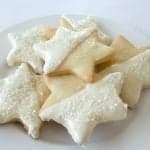 Roll the shortbread mixture until it's approximately 1cm thick and use cookie cutter of your choice to cut out the shapes. Repeat until you have used all of the shortbread mixture. Bake in oven for approx 10 minutes until edges start to turn a golden brown. Allow the shortbread to completely cool before breaking the white chocolate into squares and placing it into a microwave safe bowl. Cook the white chocolate for 30 second spurts until it has just melted. Dip the shortbread into the white chocolate and place on a wire cooling tray to allow the excess chocolate to drop off - you may want to place a piece of baking paper underneath to catch the chocolate drips! Once the white chocolate has set, store in an airtight container in a cool spot. Preheat your oven to 190 degrees and line two baking tray with baking paper. Place all of your ingredients into your Thermomix bowl and mix for 10 seconds on speed 6. Use the kneading function and mix for a further 20 seconds or until the shortbread mixture resembles breadcrumbs. Pour the mixture onto your Thermomat or a lightly floured work bench and knead until shortbread dough is smooth. Split your dough into two and cover half with cling wrap and place in the fridge. 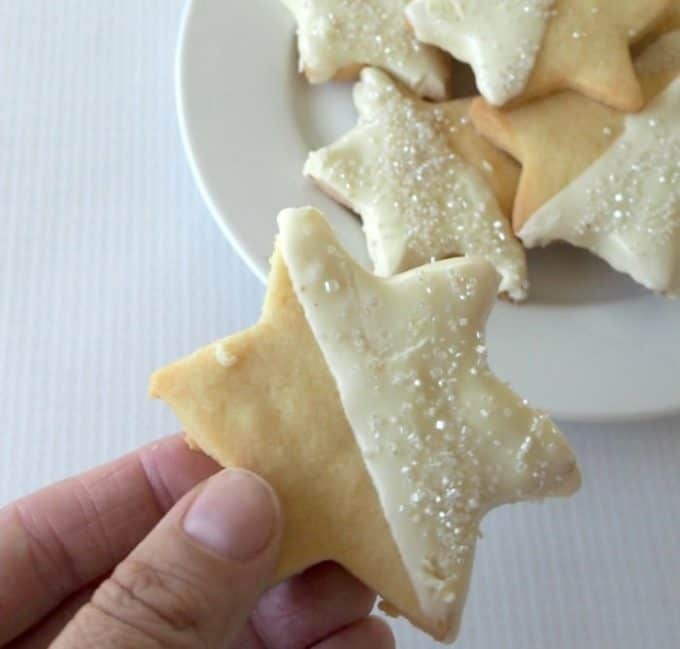 Roll the shortbread mixture until it’s approximately 1cm thick and use cookie cutter of your choice to cut out the shapes. Bake in oven for approx 12 minutes until edges of the almond shortbread begin to turn golden brown. Allow the shortbread to completely cool. Break the white chocolate into squares and place into a clean thermomix bowl. Cook for 2 minutes at 60 degrees, speed 2. If the white chocolate hasn’t quite melted (time it takes to melt will depend on the temperature of your chocolate) then cook it for a further 1 minute, 60 degrees, speed 2. Dip the shortbread into the white chocolate and place on a wire rack to allow the chocolate to drop off. Decorate as desired. Store the White Chocolate Shortbread in an airtight container in a cool place. 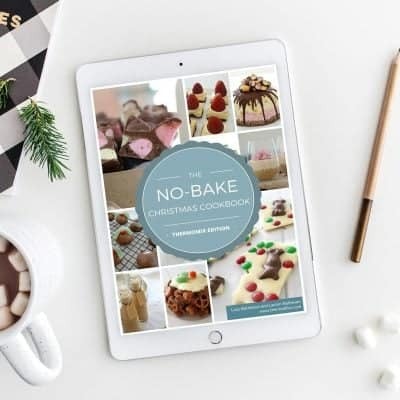 You can find more easy Christmas recipe ideas in our ‘No Bake Christmas Recipes‘ eBook – also available in a Thermomix version. DONE! I am making these this arvo. Yum!! Sharing on my blog on Friday with a few of my favourite xmas baking ideas.